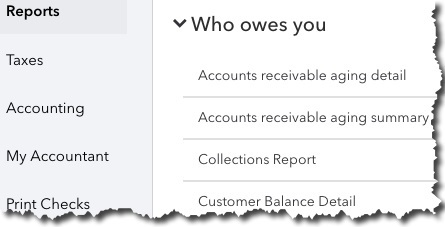 When you click Reports in your QuickBooks Online toolbar, the view defaults to All. The site divides its report content into 10 different sections, including Business Overview, Sales and Customers, Expenses and Vendors, and Payroll. Each has two buttons to the right of its name.Click the star, and that report’s title will appear in your Favorites list at the top of the page. This will save time since you’ll be able to quickly find your most often-used reports. Click the three vertical dots and then Customize to view your customization options for that report (you’ll have access to this tool from the reports themselves). Reports Note that there’s a category of reports in QuickBooks Online named For My Accountant. That’s where we come in. The site includes templates for reports that you can run yourself, but that you’d have difficulty customizing and analyzing. These standard financial reports—which, by the way, you’ll need if you create a business plan or try to get funding for your business—include Balance Sheet, Statement of Cash Flows, and Trial Balance. You do not need to have these reports generated frequently, but you should learn from the insights they provide monthly or quarterly. We can handle this part of your accounting tasks for you, as well as any other aspect of financial management where you need assistance. Contact us to learn more about our bookkeeping expertise and to discuss areas where we can assist you make better decisions for the future of your business. This is a common question: How long must taxpayers keep copies of their tax returns and supporting documents? Generally, taxpayers should hold on to their tax records for at least 3 years after the due date of the return to which those records apply. However, if the original return was filed later than the due date, including if the taxpayer received an extension, the actual filing date is substituted for the due date. A few other circumstances can require taxpayers to keep these records for longer than 3 years. The statute of limitations in many states is 1 year longer than in the federal statute. This is because the IRS provides state tax authorities with federal audit results. The extra year gives the states adequate time to assess taxes based on any federal tax adjustments. The assessment period is extended to 6 years if a taxpayer omits more than 25% of his or her gross income on a tax return. The IRS can assess additional taxes without regard to time limits if a taxpayer (a) doesn’t file a return, (b) files a false or fraudulent return to evade taxation, or (c) deliberately tries to evade tax in any other manner. The IRS has unlimited time to assess additional tax when a taxpayer files an unsigned return. If none of these exceptions apply to you, then for federal purposes, you can probably discard most of your tax records that are more than 3 years old; however, you may need to add a year or more if you live in a state with a statute of longer duration. Examples: Susan filed her 2014 tax return before the due date of April 15, 2015. She will be thus able to safely dispose of most of her records after April 15, 2018. On the other hand, Don filed his 2014 return on June 1, 2015. He needs to keep his records at least until June 1, 2018. In both cases, the taxpayers may opt to keep their records a year or more beyond those dates if their states have statutes of limitations that are longer than 3 years. Stock acquisition data. If you own stock in a corporation, keep the purchase records for at least 4 years after selling the stock. The purchase data is needed to prove the amount of profit (or loss) that you had on the sale. Statements for stocks and mutual funds with reinvested dividends. Many taxpayers use the dividends that they receive from a stock or mutual fund to buy more shares of the same stock or fund. These reinvested amounts add to the basis of the property and reduce the gain when it is eventually sold. Keep these statements for at least 4 years after final sale. Tangible property purchase and improvement records. Keep records of home, investment, rental-property or business-property acquisitions, as well as all related capital improvements, for at least 4 years after the underlying property is sold. Verifying Income. Lenders require copies of past tax returns on loan applications. Validate Identity. Taxpayers who use tax-filing software products for the first time may need to provide their adjusted gross incomes from prior years’ tax returns to verify their identities. Online Using Get Transcript. Use Get Transcript Online on IRS.gov to view, print or download a copy for any of the transcript types. Users must authenticate their identities using the Secure Access process. Taxpayers who are unable to register or who prefer not to use Get Transcript Online may use Get Transcript by Mail to order a tax return or account transcript. By mail. Taxpayers can complete and send either Form 4506-T or Form 4506T-EZ to the IRS to receive a transcript by mail. Those who need an actual copy of a tax return can get one for the current tax year and for as far back as 6 years. The fee is $50 per copy. Complete Form 4506 to request a copy of a tax return and mail that form to the appropriate IRS office (which is listed on the form). If you have questions about which records you should retain and which ones you can dispose of, please give us a call. https://tarlow.com/wp-content/uploads/2016/05/logo.png 0 0 Joanna Castle https://tarlow.com/wp-content/uploads/2016/05/logo.png Joanna Castle2018-07-23 15:02:082018-07-24 14:46:26How Long Should You Hold On To Old Tax Records?